Whether you dream of singing at local venues in Phoenix and Scottsdale or showcasing your talents at famous music halls around the globe, the steps you’ll take to get there will be the same. Every aspiring vocalist wants to learn to sing as best they can, and that starts by mastering the basics. While vocal lessons are a great first step to learning those basics skills and so much more, there are things you can do on your own, when not in voice lessons, that will help improve your singing almost instantly. This cheat sheet for signers features three easy ways to sharpen your singing and give your vocals a little oomph. 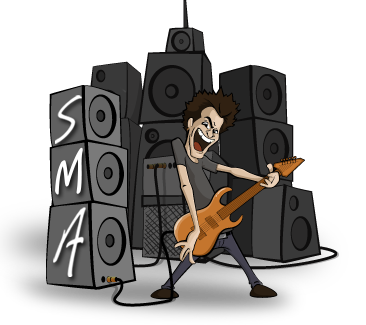 Follow these singing tips and you’ll be amazed by how much better you sing and sound…no auto-tune needed! All singers would love to be able to hit every note, but the reality is the majority of singers have a limited set of notes they can sing. Everyone is born with a natural vocal range, which refers to the highest and lowest notes one can sing without straining their voice. The good news is you can strengthen or stretch your vocal range to some degree with a little practice and dedication (vocal lessons are a great way to achieve this). But first, you need to know what your vocal range is! To find your vocal range, simply play middle C on the piano or keyboard and sing along as you move up and down the keys, matching your pitch to each note. The highest and lowest notes you can comfortably sing without straining your voice indicate the endpoints of your vocal range. Those notes, combined with all the notes in between, make up your vocal range. Knowing your vocal range is important to developing your career as a singer and for choosing songs within your repertoire that will allow your voice to shine as it should. 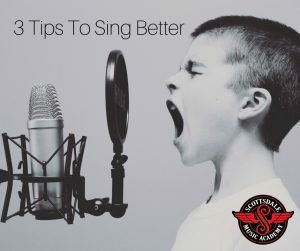 These tips are just a few of the many ways you can learn to sing better and deliver vocals on par with the biggest names in music. For even more tips and tricks, sign up for our vocal lessons in Scottsdale where you’ll learn how to develop your voice, boost your singing skills, and practice your stage presence, all while singing songs by your favorite artists. 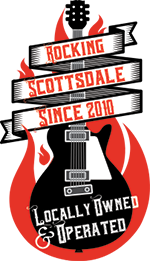 Call 602-751-3537 to schedule a vocal lesson today!